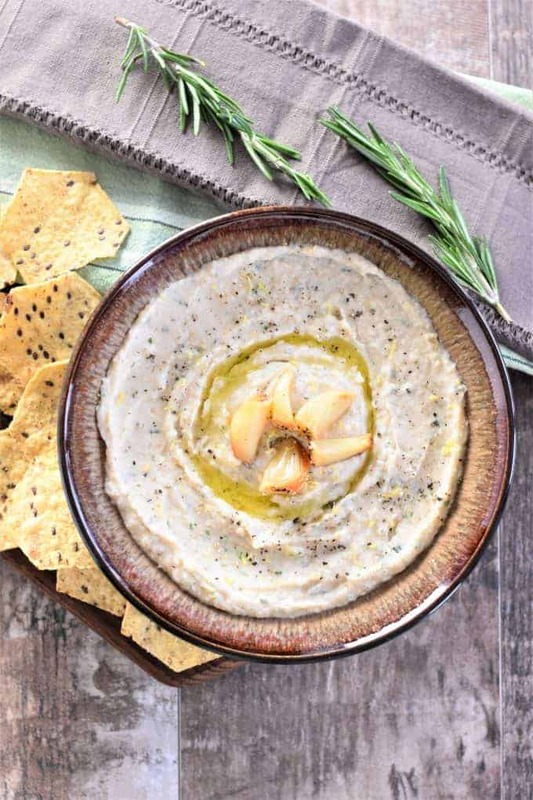 This smooth and creamy vegan Roasted Garlic White Bean Dip pairs perfectly with tortilla chips, crackers, carrot sticks or whatever edible dipping device you prefer. So, it went from me not remembering the song, “Da Dip,” even existed yesterday to me not being able to stop singing it today. I’ve come to the conclusion that I should not ask my husband for writing inspiration unless I want to have obscure one-hit wonders from the 1990s stuck in my head. The flavor I am referring to is the combination of sweet roasted garlic and buttery cannellini beans complemented by earthy parsley, robust rosemary and the freshness of lemon. Well, that was a mouthful! Speaking of mouthfuls, I’m sure you could go for a mouthful of this creamy dip right about now, so let’s get to it! It all starts with some roasted garlic. To roast garlic, first preheat your oven to 400° F. Cut approximately 1/2 inch of the top of the bulb of garlic to expose the cloves inside. Peel away any loose papery layers. Place the garlic bulb on a piece of foil and drizzle olive oil onto the exposed cloves. Season with salt and pepper. Pull up the sides of the foil to seal up the garlic bulb package. Place the garlic packet in a baking dish or on a baking sheet and roast in the oven for 35 minutes. Remove from the oven and allow garlic to cool for about 10 minutes before handling. To make the dip, add cannellini beans, lemon juice, lemon zest, parsley, rosemary, salt and pepper to the bowl of a food processor. Carefully squeeze out the garlic cloves into the food processor, reserving 3-5 cloves for garnish. Blend until smooth and creamy on high speed, and add the olive oil through the feed tube as the mixture is blending. You will need to stop periodically to scrape down the sides of the bowl. Transfer to a serving dish and garnish with reserved garlic cloves and additional black pepper and lemon zest, if desired. 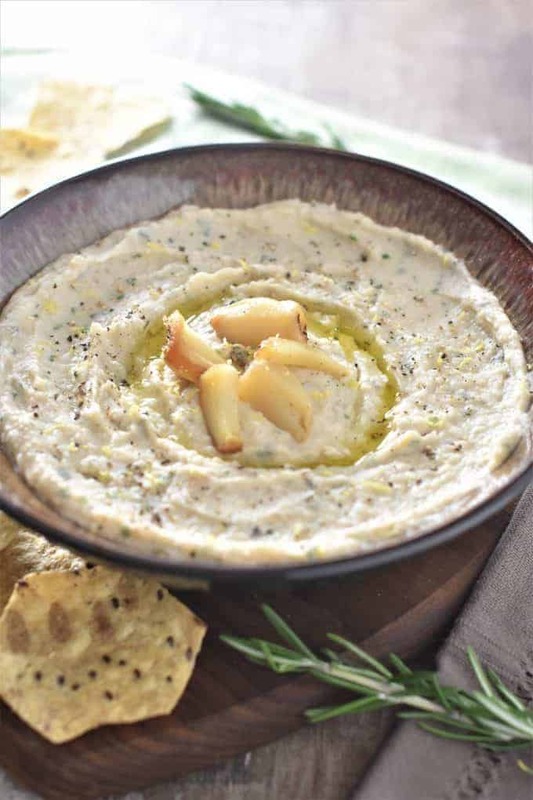 If you like this Roasted Garlic White Bean Dip, try this white bean dip made with cannellini beans and avocado next. Cut approximately 1/2 inch of the top of the bulb of garlic to expose the cloves inside, and peel away any loose papery layers. Place garlic bulb on a piece of foil and drizzle 2 teaspoons of olive oil onto the exposed cloves, and season with salt and pepper to taste. Pull up the sides of the foil to seal up the garlic bulb package. Place the garlic packet in a baking dish or on a baking sheet and roast in the oven for 35 minutes. Remove from the oven and allow garlic to cool for about 10 minutes before handling. Add cannellini beans, lemon juice, lemon zest, parsley, rosemary, 1/2 tsp kosher salt and 1/4 teaspoon black pepper to the bowl of a food processor. Carefully squeeze out the garlic cloves into the food processor, reserving 3-5 cloves for garnish. Dip may be enjoyed right away or refrigerated for 1-2 hours to further infuse the flavors. Dip should be stored in an airtight container in the refrigerator for up to 3 days. What can I serve it with? A pizza? A roasted Chicken or use it as sandwich spread?